This is a well made vintage sterling brooch from Guglielmo Cini. From Boston, MA USA [my neck of the woods] via Florence Italy, Cini began his company in 1922. 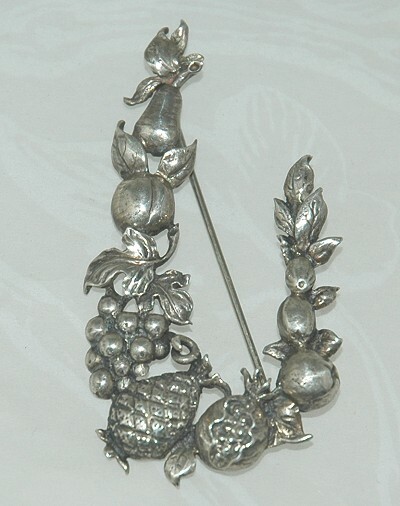 This pin is garlanded with fruit of all kind. The detailing shows a tremendous amount of skill and no doubt took a long time to fashion. Hallmark though partially rubbed off, appears on the reverse. This pin has not been polished as some customers prefer an intact patina. Condition: Excellent vintage. Measurements: 2 1/2" long and 1 1/4" wide.